Uninteresting Course, Even With An Island Hole !! I like a golf course to have some interesting holes on it, you know, you turn the corner and you're greeted by this wonderful view of a great hole. Unfortunately, this didn't have any of those. Most of the holes were straight up and down and not very interesting. 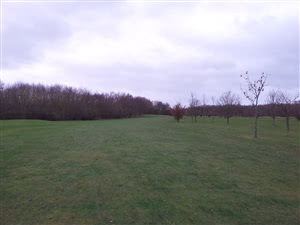 On another bad point, with the fairways being quite tight in places, landing in the semi rough was a regular occurrence and the quality of it was very poor, so many bald patches and thick tufts made it really tough to play. Greens were very good and very tricky but didn't make up for the lack of quality in other places. Clubhouse and staff were all friendly and the Full English was delicious, also, the practice facilities were very good. I don't think there's enough here to bring me back, but at least I can say I've tried it. I used to be a half member here, I learnt the game here and still have my lessons with one of the pros and regularly use the range and the putting green. It is very hard for me to say anything negative about this club. All the staff are great, the pros are great, the club house is a nice relaxed cosy place with an outside seating area looking over the 9th and 18th. The course isn't the hardest around some might say but the greens are some of the best I have ever played, its the fairways that need a little work possibly but so much time and effort has and is being put into this course that its a shame its not recognised for being a great course to learn on and have a great relaxing round as its not the hardest around. The 10th is the signature hole with it being an island green and when the sun is shining this hole and the 9th and 18th that all run parallel to each other are very picturesque in my opinion. There is also a nice little par 3 9 hole course which is where I learnt and well worth a quick go if you only have an hour to kill. The rates are very reasonable and they except 2 fore 1 and have a great membership deals if your local. The practise facilities are the best around with a great covered range with targets, floodlights. The putting green is not as easy as it first looks and as its lit up at night so you can practise until the place shuts at 10pm. If you don't mind a walk you can go to the old 2nd green and hit off grass, use the bunker and putt on a 'real' green. This may just be for members though, not sure. The club house is relaxed about clothing so a nice place to have a pint and in the summer a great place just to sit and have a drink and watch the players come in. Also the food is really impressive for the cost. The course itself is a little up and down on the back field it is true but I defy anyone to say the 12th isn't one of the hardest holes around and the long par 4 17th is a real test for anyone to get par. Add the three holes over water, the tight par 5 3rd and you have enough challenges I think to make it worth the money. Please give it ago. It might not be Wentworth but its a lot better than some I've played around this area and it doesn't deserve the comments I hear about it. Loads of work had been completed and the green keepers deserve a lot of praise. Front Nine tight / Back nine in a field?? as per previous reviews the front nine is tight in places with some nice holes and the greens were in good nick the bunkers i found had sand in them. the island green was tricky and looked nice. the back 9 was very open you just seemed to go back and forth a couple of tricky greens though. well worth a visit great price including breakfast seemed a very busy place. just a shame about all the geese droppings. Horton has good practice facilities with a full driving range and putting area. Price was good as it included full English breakfast. Course is ok, a large number of holes seem to be next to each other [you would go up one and back down the other]. Best hole is 10th with Island green. Greens were good - true and medium speed. Good course to play in the winter as no temporary greens. Use of ordinary trolley permitted as well. Some temporary matts but that is expected for a Parkland course. Friendly welcome in the Pro Shop and the Clubhouse. Very reasonable rates. Will return to conquer Hole No. 9. Course must be very attractive in Spring and Summer.